Good nutrition is essential to maintaining health, especially as you get older. My Plate from the USDA has replaced the traditional food pyramid, featuring a divided plate graphic representing the major food groups. The U.S. Department of Agriculture created My Plate to help Americans choose the right combination of foods each day for optimum nutrition. 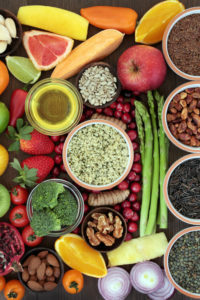 It divides foods into groups — bread, cereal, rice, and pasta; fruit; vegetables; milk, yogurt, and cheese; meat, poultry, fish, dry beans, eggs, and nuts; fats, oils, and sweets — and describes how much of each food group people should eat. Certain food groups can help you lose weight. Eating high protein foods such as lean chicken breast, beans, fish, and tofu curb hunger, so you eat less. Protein is an important component of any diet, but it shouldn’t entirely replace other food groups, including whole grains, fruits, and vegetables. A low-carb diet such as Atkins or South Beach is another approach to weight loss that emphasizes protein and unsaturated fats. These diets limit carbs from grains, starchy vegetables, fruit, and other sources. Yet this diet may not be a good long-term approach. While low-carb diets do encourage weight loss in the short term, after a year or two they offer little advantage over more balanced dietary patterns. Watching your calorie intake is another way to control your weight. An online calorie counter can help you determine how many calories are in the foods you eat, and how many calories you consume each day. Pair up a calorie counter with a weight loss calculator, in which you input your weight, height, age, activity level, and the amount of weight you’d like to lose. The weight loss calculator will help you determine how many calories you should eat each day to reach your goal.